Your skincare could be making you fat. It sounds crazy, right? We thought so when we first heard about this too, but after digging deeper and doing some research it sounds like even though there’s still debate surrounding the issue there is some truth to the matter. What we are talking about are ingredients called Obesogens and Endocrine Disrupting Chemicals (EDCs), and these bad guys could not only be causing you to gain weight, but may be affecting your health in other ways. Even though more research is needed to know the true effects of EDCs on our body it’s still quite eye opening. The name “obesogens” refers to chemicals that upset your body’s ability to regulate your weight, and they could cause you to gain weight despite having a normal diet and exercise routine (Reference: Dr Blumberg – The case for Obesogens, Molecular Endoncrinology Volume 23 Issue 8 August 2009). Obesogens are also part of a bigger group of chemicals known as Endocrine Disruption Chemicals (EDCs). These chemicals have the ability to interfere with our hormone system. Our hormone system is very complex and it influences many aspects of our health. Hormones play a major role in our reproductive system, nervous system and brain. So anything that disrupts your hormones can have a major impact on your health and wellbeing. How are obesogens linked to us not being able to lose weight?? It’s no secret that western waistlines are growing and new research has found that there could be more to it than diet and exercise (or lack thereof). There is an environmental factor and it is in relation to our chemical load. Our level of exposure to obesogens could be one of the factors why we gaining weight or find it difficult to lose weight. Because obesogens mess around with our hormones they also mess around with our metabolism and encourage your body to store fat rather than burn it for energy. They also disrupt the signal that tells your brain that you are full, so you eat too much. Researchers believe that your body stores obesogens in fat cells as a way of protecting itself because your body recognises them as toxic. Your body doesn’t want toxic stuff moving around freely. And the really bad news is that your body may be even creating more fat cells to store excess toxins. Which common ingredients could be making us fat? Pthalates – These are used in cosmetics to help product cling to the skin and also in fragrances to make them last longer. 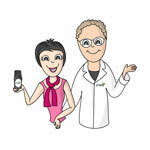 If you see parfum or fragrance on the label then it is likely that phthalates are present. Parabens – These need no introduction (but in case you do need an introduction, click here). Just another reason to avoid products containing these estrogen mimicking ingredients. Lead – One to watch out for as it is in many leading lipstick brands. Lead is not only an obesogen but also a neurotoxin. It can accumulate in the brain, liver, bones and thyroid over time which may lead to health problems. Siloxanes– These are suspected EDCs. They are used to make the skin feel soft and smooth. Look for ingredients that end in ‘siloxane or ‘methicone’. Dimethicone and Cyclomethicone are very common in shampoo and conditioner. Tricoslan – A very powerful antibacterial ingredient and has been classed as a pesticide by the Environmental Protection Agency. So you have a very good reason to ask why it is used in toothpaste, deodorant and soaps which run into our waterways. As well as being known to disrupt endocrine function making it harmful to us humans it is also harmful to our environment and wildlife. So watch out for these bad guys and if you avoid them, there’s a chance you might find yourself shedding some extra kilos over time! You’ll never find any ingredient that’s linked to hormone disruption or with any questionable reputation in a Happy Skincare product, but it would be a good idea to check the labels on the other products you have in your bathroom cupboard. We must say a thank you to our friend Christine Cronau for bringing all this business about obesogens and EDCs to our attention. Christine is the author of the best-selling book – The Fat Revolution and you can check out her website here. If anyone has some good tips on how to reduce our chemical load and exposure to EDC’s we would love to hear them. Just let us know by commenting below. The post Your Skincare Could Be Making You Fat appeared first on Happy Skincare.